Seemingly from out of nowhere, New York-based guitarist-composer Chris Taylor has emerged after nearly 30 years on the scene with a brilliant, fully-realized first album as a leader. And though it's been a long time in coming, Nocturnal may be the most auspicious debut of the year. Reflecting the influences of such potent bands as Weather Report, Tribal Tech and the Zawinul Syndicate, as well as such guitaristic icons as John Scofield, Bill Frisell and Allan Holdsworth, Taylor's compelling album also stakes out strikingly original territory. From cinematic offerings like “Voices in my Head," the atmospheric “All of Us" and the dreamy soundscape “Recluse" to super-charged jams like “Ear to the Rail," “Know What I'm Saying," “Odd Hours" and the anthemic “Here to There," Nocturnal resonates with audacious energy and ideas. Taylor is ably supported on his maiden voyage by a stellar crew featuring drummers Gary Novak, Dave Weckl, Joel Rosenblatt and Kirk Covington, keyboardists George Whitty and Scott Kinsey, bassists Ric Fierabracci and Gary Haase, and saxophonist Steve Tavaglione. It was back in 1981 that Taylor left the Berklee College of Music after three semesters to begin his professional career, and he's been gigging ever since. “Basically, I ran out of money," says Taylor of his brief stint at Berklee. “The plan was to go gig for a while, make some money and then go back to Berklee. I ended up gigging for 20 years or so and never got back to school. And since then I've done every gig imaginable." Over the years, Taylor has played on innumerable sessions as a sideman and even contributed his own compositions on some recordings. But he had never taken the time to put his own album together, until now. “I never thought of myself as a leader," says Taylor, “but I've been writing music forever, since before Berklee. Writing was something that I've always enjoyed. I like to do it more than playing guitar. I'm much happier composing, I think." The composer acknowledges his debut to such fusion juggernauts as Weather Report live or the Zawinul Syndicate or even Tribal Tech on his debut outing. While tipping his hat to those powerful influences throughout Nocturnal, Taylor turns in some more personal statements on the stirring title track (imbued with his evocative slide guitar work), the evocative “Green Divided by Blue" (named for the composer's fascination with the impressionist painter Rothko) and the provocative “Bela" (which incorporates some samples from a George W. Bush speech). “I like to tell the story through sound," he says of those vivid pieces. A triumph from start to finish, Nocturnal is an impressive introduction to this new 50-year-old face on the creative instrumental music scene. Guitarist Ed DeGenaro's latest release, Less Is Seldom More (Unfretted Records), is a perfect follow-up to his 2007 disc Dog House. While the two albums share many of the same qualities (largely gapless playback, an eclectic mix of styles, etc), DeGenaro pushes the "avant-garde fusion" envelope a bit further with this new disc, and enlists an awe-inspiring lineup of musicians to help him do it. Most people probably associate DeGenaro with fretless guitar, which is understandable; he is widely heralded for his great work on that instrument. But while there is plenty of fretless playing on Less Is Seldom More, DeGenaro doesn't beat you over the head with it; his approach with the fretless, at least on this recording, is usually subtle. In the hands of most players, the fretless guitar sounds like an untame-able beast. Even the simplest phrase with no slides will give it away, because they just don't have the touch to keep it in tune, and in control. In DeGenaro's hands, however, you usually can't tell it's a fretless until he wants you to. In other words, he uses the instrument for it's unique ability to extend your own inflections and dynamics, rather than exploiting it as a novelty. Less Is Seldom More is largely a collaborative effort between DeGenaro and producer/composer Chris Taylor. Taylor wrote or co-wrote most of the songs, and also contributes keyboards, guitars, and some programming (Taylor was involved with Dog House as well, but to a lesser extent). The list of guest musicians on this disc is as impressive as it is extensive. Along for the ride are Dave Weckl, Joel Rosenblatt, and Marco Minnemann on drums, Ric Fierabracci and Trip Wamsley on bass, George Whitty on organ, Matte Henderson and fusion legend Ray Gomez on guitar, and several others. Similarly to Dog House, Less Is Seldom More feels like one continuous fusion piece that shifts through many moods and styles. Some of those moods are more traditional than others, but throughout the disc, DeGenaro's creativity and musicianship are loud and clear. After a snappy blues guitar "Intro," things kick into high gear with "Avenue D" - a hard driving jazz fusion tune with great solos by Whitty, Fierabracci, and of course DeGenaro. Even though this piece is loaded with, effects and edits, it ends up being one of the more traditional-sounding songs on the album. The next four tracks ("Monkey Bawls Utility," "Utilitarian Research Jam," "Matte's Bible Camp," and "Confirm Walk Forward") provide the first foray into what I would call "avant-garde" fusion. DeGenaro takes an "everything but the kitchen sink" approach with some of these pieces, throwing in lots of mood shifts, instrumentation changes, you name it. There are occasionally heavy riffs and sheets-of-sound shredding, but there's a lot of sonic experimentation as well. I particularly like "Utilitarian Research Jam," which has a Zappa-like quality in it's melodies. The slowly-building ballad "Matte's Bible Camp" (written by Matte Henderson) is a great piece as well. The vocals that comprise one of the main themes are almost creepy, especially when they are first introduced at the beginning. Talk about evoking a mood. These four songs illustrate what's great about the album as a whole - it's a refreshing change from a typical "fusion" album that will have a set instrumentation and band that varies little from the first song to the last. "Prayer" and "Joe Z" both feature Ray Gomez guesting on guitar, but they are actually one continuous piece split into two tracks on the disc. DeGenaro recorded "Joe Z" (written by Taylor as an homage to Weather Report founder Joe Zawinul) on his Dog House album as well. This new version is a bit more guitar-centric, and has less of the Indian quality that was prevalent on the Dog House version. Gomez sounds great here. The guy is an old pro who's been around a long time; his lengthy list of recordings includes the 1976 Stanley Clarke album School Days - a fusion classic. What a great player. DeGenaro loves to shift moods on you, as evidenced by the next track - the Buckethead-like "Yes Man." This heavy tune is an incredible chops showcase for both DeGenaro and guitarist Matte Henderson (who also wrote the song). It also features some nice fretless work during the outro. The proceedings turn on a dime again with the fast country tune "Neck Bone," which has DeGenaro showing off his prodigious picking skills. DeGenaro also includes a version of the Robben Ford tune "The Brother (For Jimmie & Stevie)." Ford recorded the original in 1992 as a tribute to Jimmie and Stevie Ray Vaughan. DeGenaro's version adds a heavy intro with some spoken-word samples, but leaves the rest of the tune's structure largely intact (except for some hide-the-downbeat monkey business). It also has some of DeGenaro's best blues playing on the album. After a quick Tribal Tech-style piece called "One," DeGenaro launches into "Southern Flyer." This in an instrumental rock tune written by John Czajkowski (Hectic Watermelon), and is clearly the most straightforward track on the disc. I love the wide interval melody on this song, and the solo section which has DeGenaro trading off with guitarist Dave Simpson. George Whitty's organ playing gives the song a Deep Purple sort of vibe as well. Since the album opens with "Intro," it's only natural that it closes with "Outro" - a beautiful piece of acoustic blues improv. Less Is Seldom More is another illustration of DeGenaro's great strength: his ability to mix a wide variety of styles under the banner of instrumental fusion. Jazz, metal, country, blues, electronica, it's all here, done with an experimental adventurousness that few musicians posses. The common thread through it all is DeGenaro's great guitar work. Whether he's playing fretless or fretted guitars, guitar synth, acoustics, etc, DeGenaro's killer playing is well represented throughout the entire disc. Great stuff. My review of fretless-guitar master Ed DeGenaro's latest album Dog House has been published at Modern Guitars Magazine. 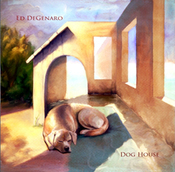 Dog House (Unfretted Records) is fretless-guitar whiz Ed DeGenaro's latest release. Though he plays plenty of fretted guitar as well, DeGenaro is one of the finest and most popular players on the fretless scene today. He appeared front and center on 2005's Village Of The Unfretted double-CD compilation (also on Unfretted Records), and performed at last year's Fretless Guitar Festival in New York. In addition to his previous solo recordings, DeGenaro has done quite a bit of session work for commercials, television shows, and movies. DeGenaro describes himself as a fusion player, and the music on Dog House lives up to the purest definition of that label. Country, jazz, reggae, funk, rock, blues, Latin music - DeGenaro touches on all these styles and more on Dog House, often mixing several styles within the same song. As a result, this album comes across like a stream of DeGenaro's musical consciousness. That impression is heightened by the fact the entire CD is presented with no gaps between the tracks - each song flows directly into the next. DeGenaro used a vast array of guitars on Dog House including fretted and unfretted electrics (6, 7, and 8 string), classical and steel-string acoustics, slide, lap steel, etc. There's also a fair amount of guitar-synth on the album, which DeGenaro used to trigger saxophone, flute, and other assorted samples. There are some vocal samples sprinkled throughout as well, though Dog House is essentially an instrumental album. Listen to enough fretless guitar players and you'll quickly realize there's a fine line between making music on the instrument, and making an abominable mess on it. Mastering the subtleties in pitch and inflection a fretless guitar allows for is obviously a difficult thing to do, but DeGenaro has done it. Although he's a great player on standard fretted guitars as well, DeGenaro seems more expressive on a fretless. And with or without frets, DeGenaro can flat-out shred. Using highly developed picking and legato techniques, his cascading runs of varied note-groupings are often reminiscent of the late Shawn Lane. Dog House features a whopping 18 tracks, and there are many highlights. After starting off with the country-flavored "Twang This" and "Teutonic Hellbelly," DeGenaro gives us the album's first fretless showcase - "Fretless In Seattle." Often evoking a violin or pedal steel guitar, DeGenaro's melodic phrasing on this song shows what a uniquely lyrical instrument the fretless guitar can be in the hands of someone who knows what they're doing. More great fretless work can be heard on "Joe Z"; an obvious nod to Weather Report founder Joe Zawinul. "La Mer" is another highlight. DeGenaro plays some great Django-esque runs on this track. Songs like "SFW," "North Coast," "Hoppier Than Thou," and "Hip To Hop" (which differs from DeGenaro's Village Of The Unfretted version of the same song) are closer to what most people consider fusion. These are grooving jazz-rock songs that give DeGenaro a chance to really blow. "SFW" and "North Coast" feature some particularly wild playing. The chops highlight of the album though is "Charlie Parker Goes Heavy Metal." This is an insane solo-guitar shred showcase, featuring a harmonizer and plenty of edits. There are definite shades of Shawn Lane on this piece. In contrast to that track's electric madness is the great acoustic work on Dog House, including the Bireli Lagrene composition "Acoustic Moments," and a fine instrumental version of the Steely Dan classic "Aja." The common denominator throughout this diverse recording is DeGenaro's great playing. He brings an obvious familiarity to whatever style he happens to be working in, and his great chops are always in tow. That's true whether there are frets present or not, but his fretless playing on Dog House really shines. By using the fretless so effectively in a such a wide variety of settings, DeGenaro really champions the instrument with this album. If you have any interest in fretless at all, or just want to hear a fine guitarist at work, pick up Dog House.